We know it as Roosevelt island. 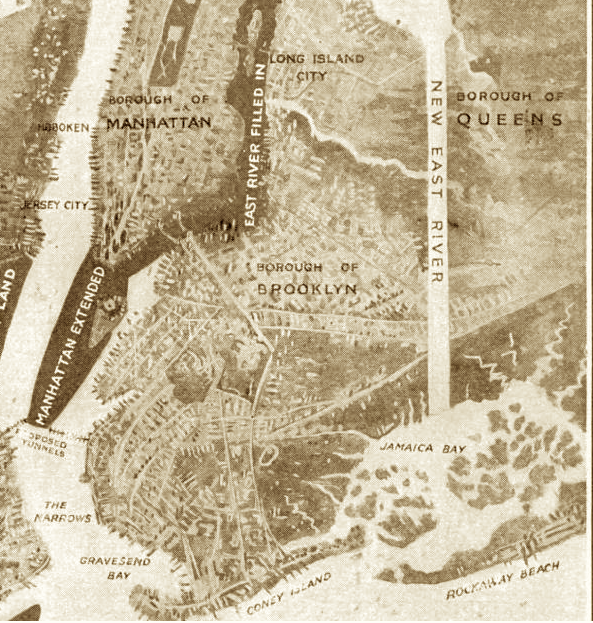 But until the 1920s, it was Blackwell’s Island—the two-mile spit of land in the East River. Here, the 19th century city put its poor, quarantined, and convicted in penitentiaries, a lunatic asylum, and a smallpox hospital, among other institutions. 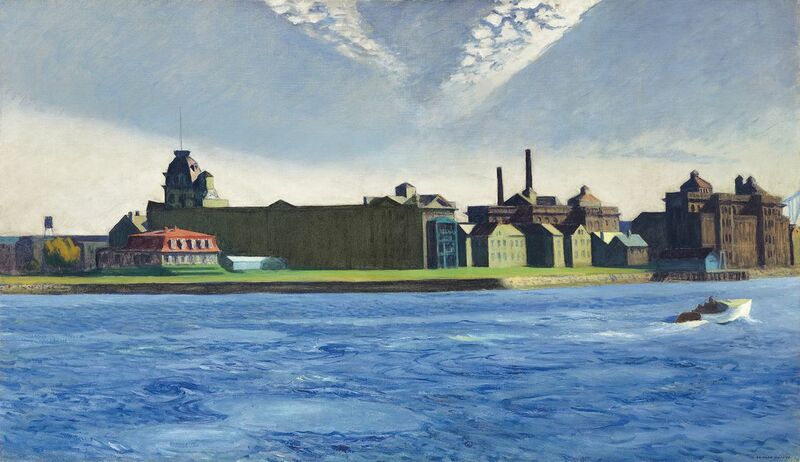 Edward Hopper’s 1928 painting, Blackwell’s Island, contrasts the cobalt blue waters of the East River (so lovely a speedboat is whizzing along) with the island’s haunting past as a broken-down dumping ground for so-called undesirables. There’s almost no one in the painting—but you can feel the humanity emanating from those buildings. Hopper “painted this work at the height of his powers and it exemplifies some of the best of Hopper’s style: a complex architectural composition with a full range of light and shadow, few people and the drama of the past colliding with the present in the form of historic architecture meeting modern,” says Don Bacigalupi, president of Crystal Bridges, which owns the painting. That’s the lead sentence in a fascinating article published in Popular Science in 1916, written with great enthusiasm by an engineer, Dr. T. Kennard Thomson. The craziest idea? 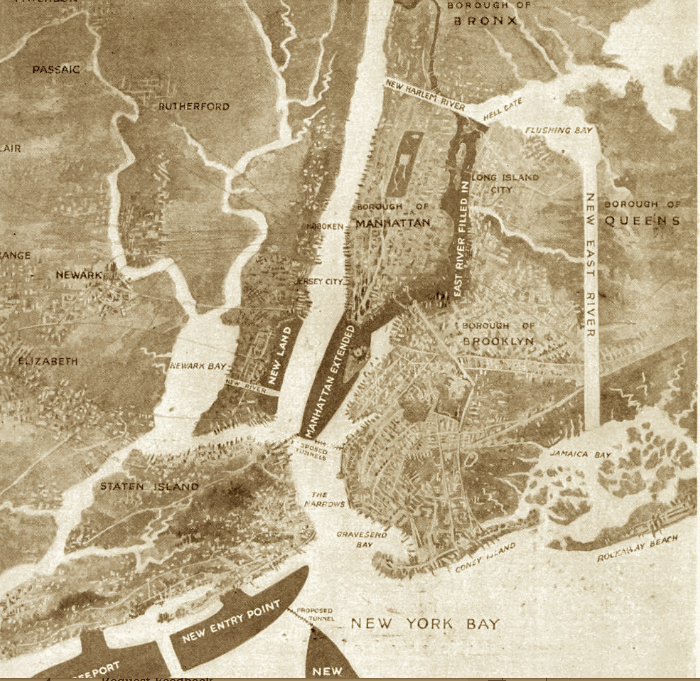 To turn the East River into a landfill extension of Manhattan, so “it would not be much harder to get to Brooklyn than to cross Broadway.” A new East River from Flushing Bay to Jamaica Bay would then be built. Also nuts is the plan to lengthen Lower Manhattan so it just about touches Staten Island, and rework the Harlem River so it extends in a straight line from Hell Gate to the Hudson. The point of his Really Greater New York? To rake in more money. “Imagine the value of this new land for docks, warehouses, and business blocks! The tax assessments alone would make a fortune!” Thomson writes. 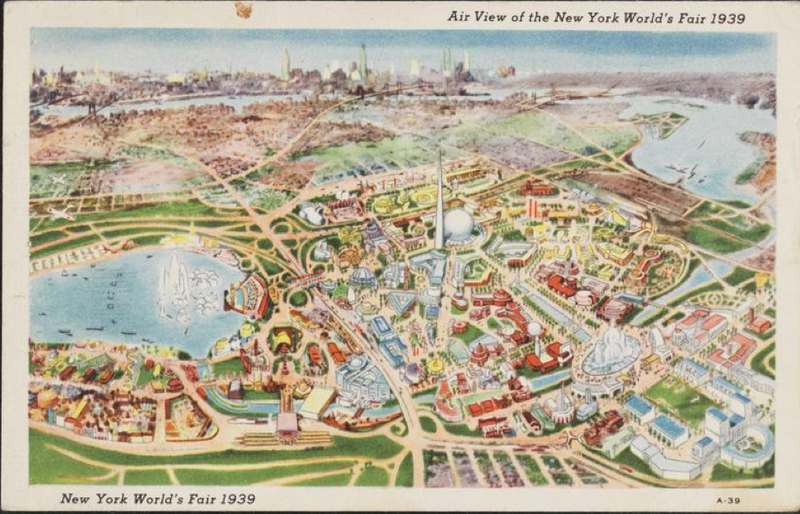 But like moving sidewalks, a West Side airport, and 100-story housing developments in Harlem, and an even weirder 1934 plan to fill in the Hudson River, this is another bizarre plan for the city that never came to pass. Art that captures a single moment of beauty and activity on New York’s streets is always captivating. But there’s something to be said for images that reveal something about Manhattan from a far away vantage point, showing a city not in the center but on the sidelines. 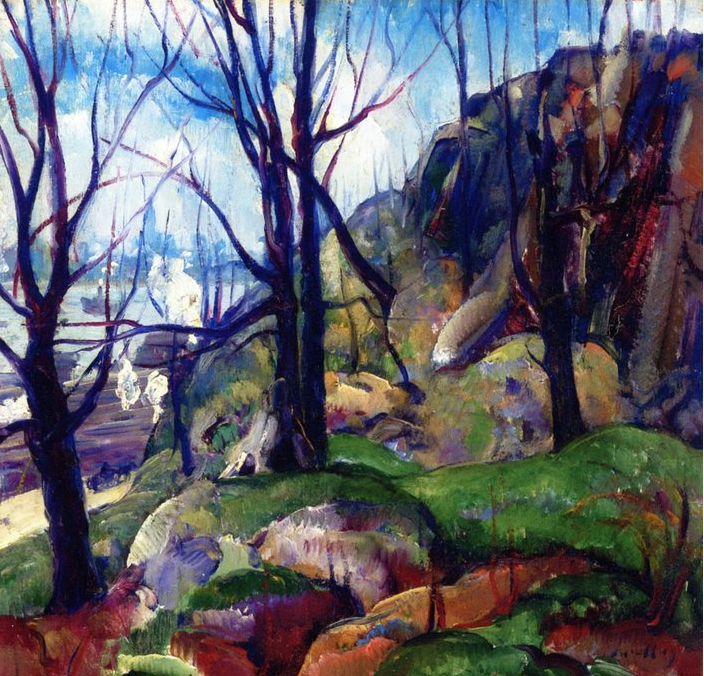 Leon Kroll, born in New York in 1884 and a contemporary of George Bellows, Robert Henri, and other social realists, gives us that sidelined city. 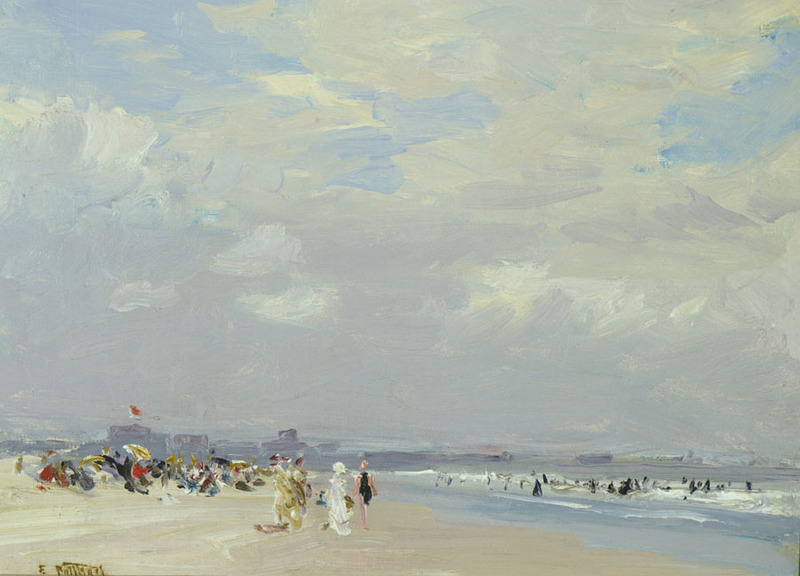 Kroll, who studied at the Art Students League and exhibited at the famous 1913 Armory Show, was known for his nudes and country or seaside landscapes, and he also painted Central Park, Broadway, and other city locations. 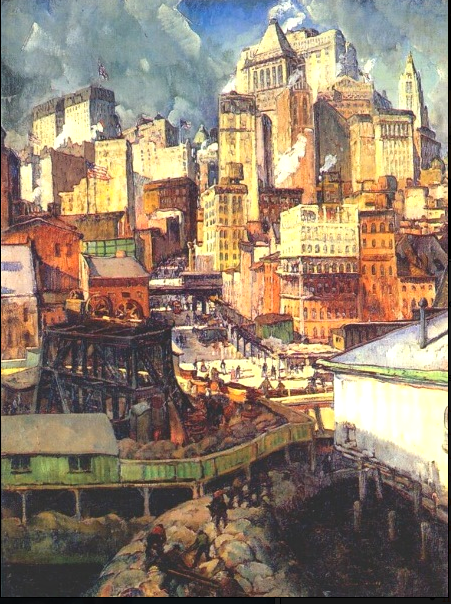 But he also depicted New York in the early 20th century from the outside in, illustrating the city’s rhythms from across the East and Hudson Rivers. 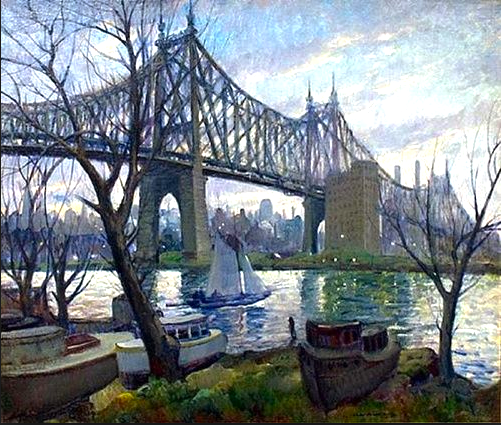 “Queensboro Bridge,” from 1912, the painting at the top of the page, is one such example. The majesty of the relatively new bridge (only three years old here) takes center stage, but the monolithic city looms behind it. I’m not exactly sure where Kroll was when he painted the second image, 1920’s “Manhattan Rhythms,” the second image. He presents us with a solid, impenetrable city high above the wharves and docks of the river, a metropolis that dwarfs the men who work there. 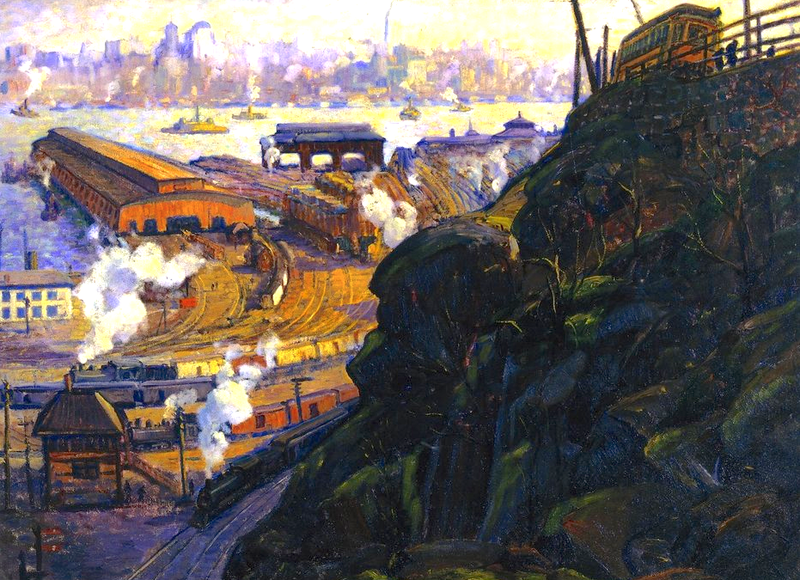 “View of Manhattan Terminal Yards From Weehawken” (1913) puts industry and commerce on display. The train tracks may be on the New Jersey side of the Hudson River, but they and the boats sending smoke into the sky work to enrich Manhattan across the water. 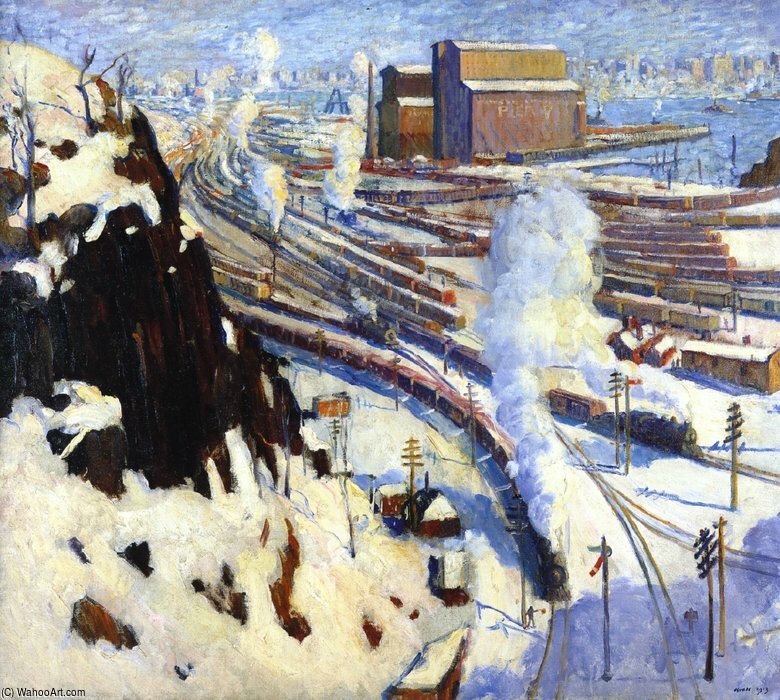 “Terminal Yards,” the fourth painting (also 1913) gives us another, snow-covered view. I love that the city skyline is barely in “Manhattan From Hoboken” (1915), another painting of the metropolis from the heights of New Jersey. The vibrant colors and web of tree branches—not to mention the thick clouds and smoke coming from boats and trains beside the river—almost obscure the Empire State Building and the rest of the cityscape. If you’re not there in the middle of it, New York is far enough away to feel like another country. 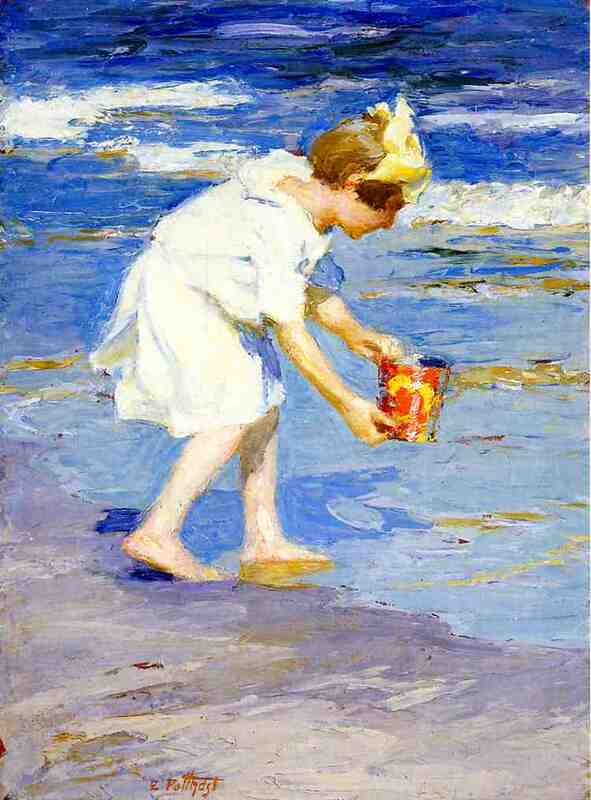 Impressionist artist Edward Henry Potthast, born in Cincinnati in 1857, never married and had no children. 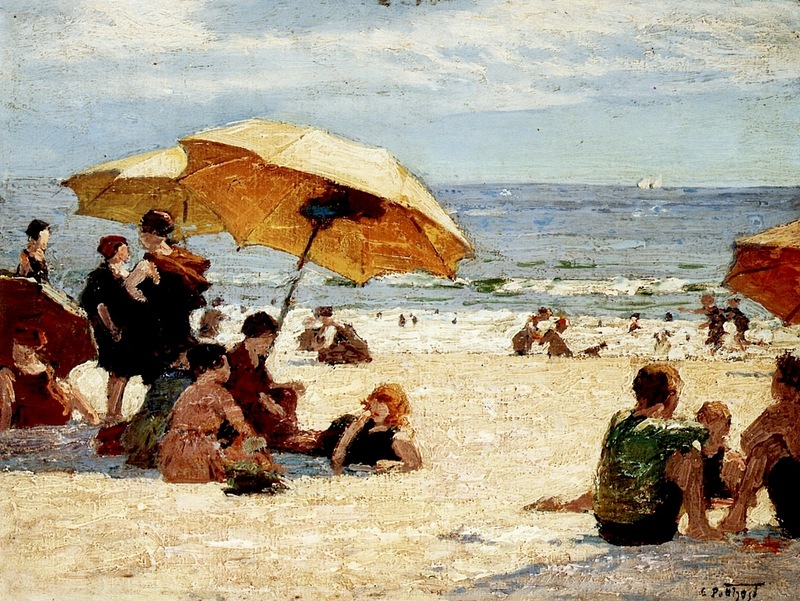 But this devoted painter who made art his entire life (he even died in his studio overlooking Central Park) seemed to find deep delight in depicting scenes of families, especially young mothers and children, enjoying the sand and surf at the city’s seaside pleasure outposts. 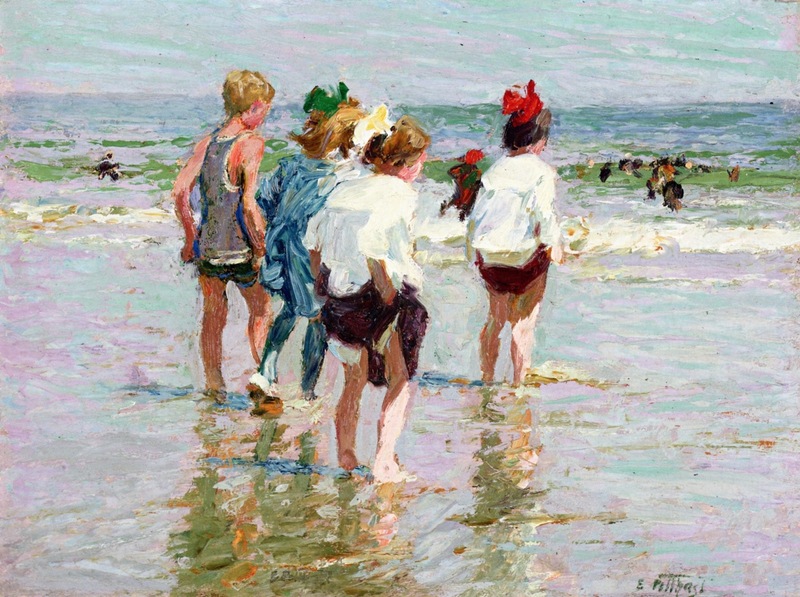 After studying art in Europe, Potthast permanently relocated to Manhattan in the 1890s, working as an illustrator for monthly publications such as Scribner’s and Harper’s while painting and exhibiting his own work. 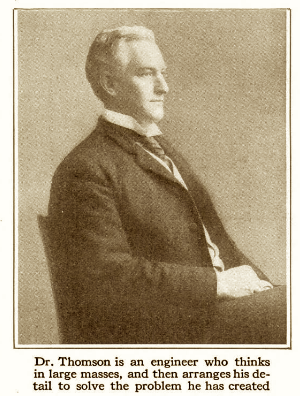 He lived and worked at the Gainsborough, a building of artists’ studios on Central Park South that opened in 1908. 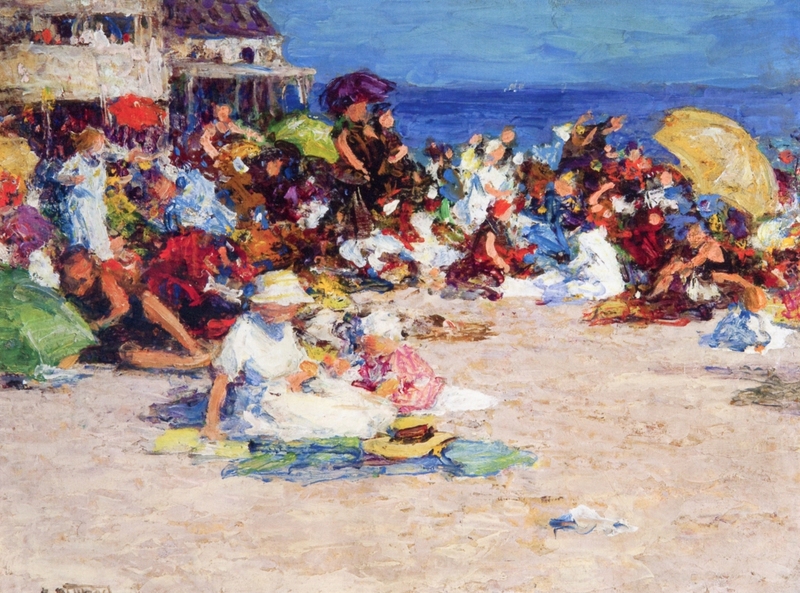 “After his move to New York, Potthast made scenes of people enjoying leisurely holidays at the beach and rocky harbor views his specialty,” states this biography. 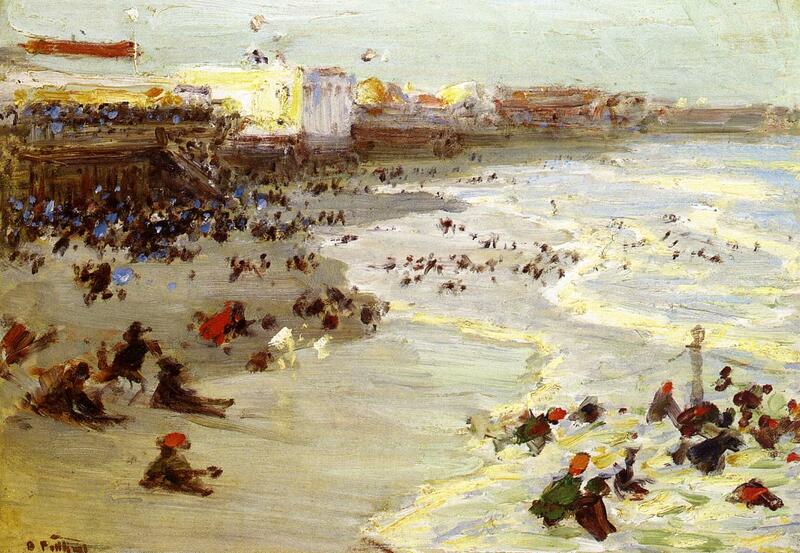 While Coney Island and the Rockaways have been popular with painters since these resorts began attracting massive crowds in the late 19th century, Potthast’s beach scenes don’t resemble not the tawdry Coney Island of Reginald Marsh or the foreboding Coney of Alfred Henry Maurer. 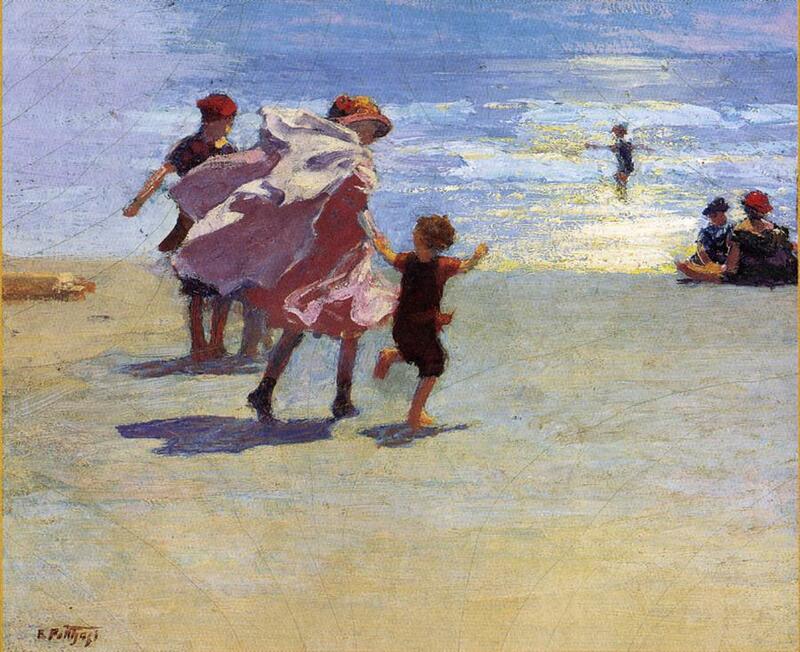 Instead, they show the gentle and genteel side of the city’s beaches in the 1910s—vivid with color, activity, and a dreamy innocence that makes one wish they could be instantly transported there, away from the complexities of contemporary life. They’re among the oldest artifacts in New York City: two twin millstones, weathered by the elements and with curious straight-line engravings, dating as far back as the 17th century. 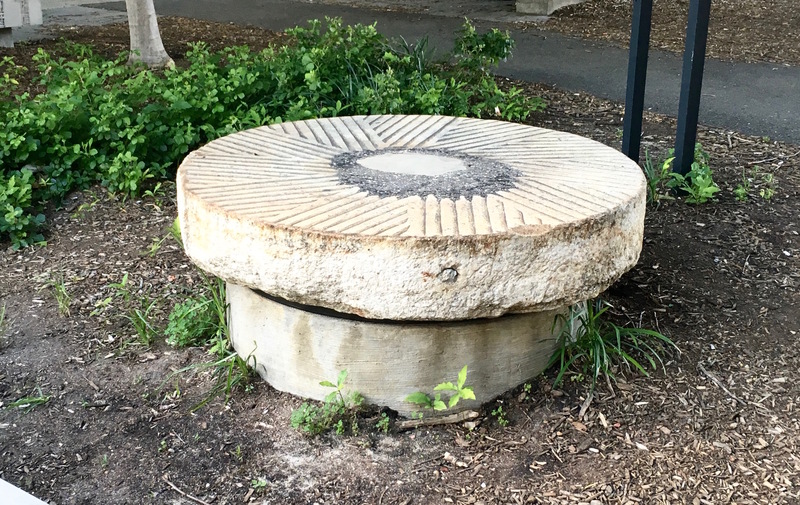 On display in a Queens Plaza greenspace, the millstones are contemporary link to colonial-era Queens, where the two stones most likely worked in tandem grinding corn and wheat into flour in a nearby gristmill powered by East River tides. 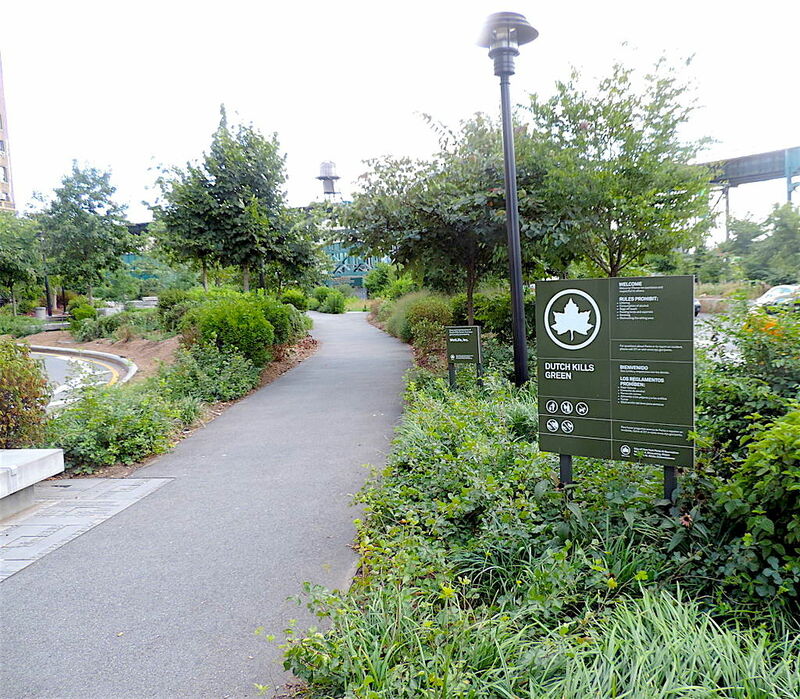 “By 1770 some five tide mills could be found along the coast of western Queens, servicing the hamlets of Dutch Kills, Ravenswood, and Astoria, which later joined to form Long Island City,” states the New York City Parks Department. The two millstones are thought to be from a gristmill founded by German immigrant Burger Jorissen in the 1640s. His mill was located on present-day 41st Avenue and Northern Boulevard, according to the Parks Department. The mill operated for two centuries. 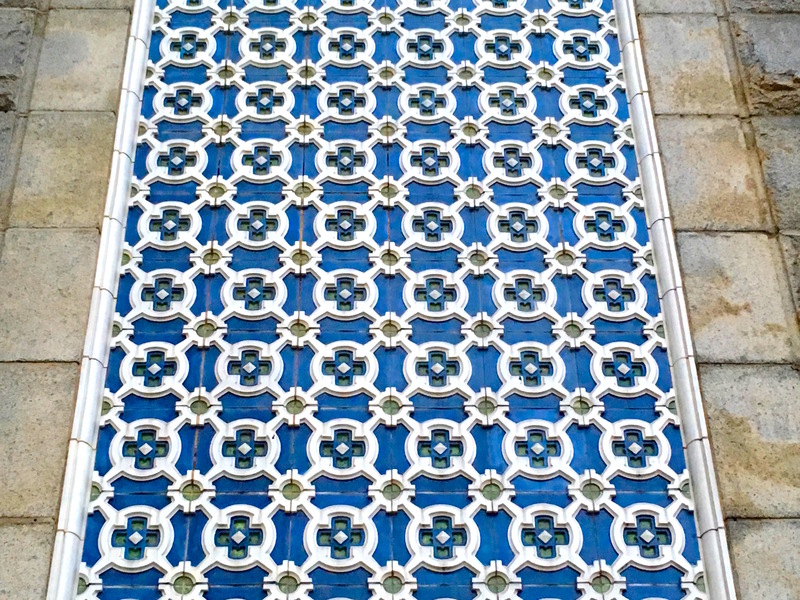 It ended up in the hands of the Payntar family and was ultimately demolished in 1861. The Payntars put one of the millstones in the sidewalk in front of the family house—and a descendant in the early 1900s had it embedded in concrete in then-new Queens Plaza, states one source. 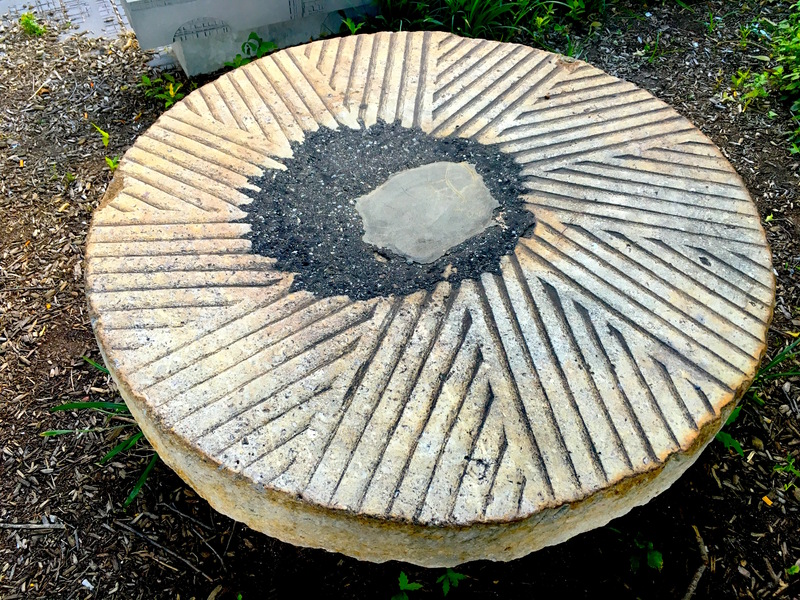 The second millstone was reportedly discovered in the 1980s. Both reunited stones ended up in a traffic island. In concrete they remained, subject to wear and tear, until 2012, when they were moved to a new small park called Dutch Kills Green (top photo). The damage to these relics continues. 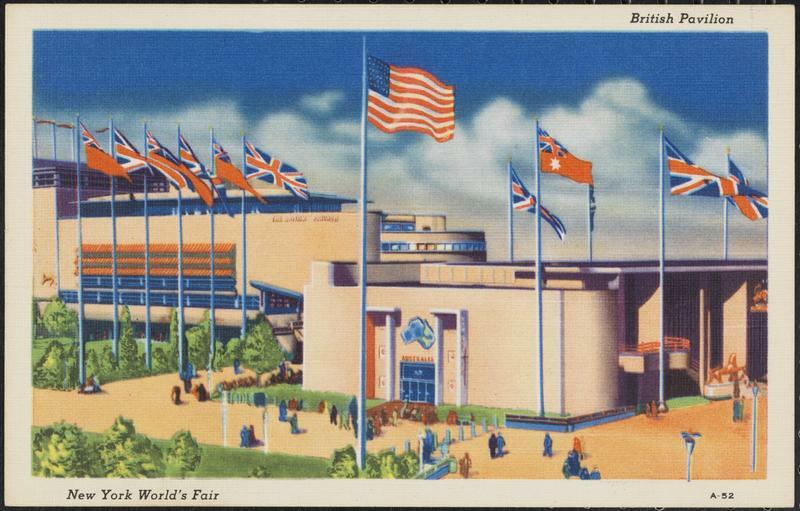 There’s still a lot of nostalgia for the New York World’s Fair of 1939 and 1940—an ode to progress and optimism that helped distract the city from the harshness of the Depression and an escalating war in Europe. But amid the fun spread out on 1,200 acres along a former ash heap in Queens, the fair has a grim distinction. It was the site of a mysterious bombing that killed two policemen. The crime remains unsolved 76 years later. The blast happened on Independence Day in 1940. An electrician in the British Pavilion noticed a suspicious canvas overnight bag—then realized it was ticking. The electrician brought the bag to his boss, who had security carry it out of the pavilion to a fence about 150 away. The NYPD bomb squad was contacted. Squad members were already on alert, as a call came in two days earlier warning that the pavilion would be blown up. “At 5 p.m., the peak of the pavilion’s teatime holiday business, two squad members, Detectives Joseph Lynch and Ferdinand Socha, squatted near a 20-foot maple tree, crouching over the little buff-colored bag,” explained the New York Times in a 2008 article. Almost instantly, the bomb exploded in their faces, killing them and critically injuring five other security and law enforcement officers. Fair-goers nearby thought the explosion had come from firecrackers, which had been set off intermittently throughout the day for the Fourth of July holiday. Police were unable to trace the call that warned about the bomb. While trying to gather clues, they rounded up “Bundists, Fascists, or members of the Christian Front” who were attending open-air meetings in Columbus Circle. None of those suspects were charged, and the city apparently had no leads. Police thought maybe IRA sympathizers planted the bomb. An ex-Bund member was questioned but let go. Despite a $26,000 reward, no one was ever arrested. 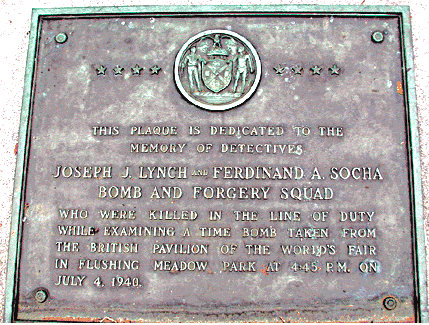 Before the start of the 1964 World’s Fair at the same site, a plaque was dedicated to Lynch and Socha, killed in the line of duty 24 years earlier. As the Brooklyn Bridge began rising to the south in the 1870s, plans for a second bridge linking Manhattan to Long Island were getting off the ground. “The projectors of this proposed bridge over the East River, between New York and Brooklyn at 77th Street, by way of Blackwell’s Island, have, in response to the invitation sent out, received ten separate designs and estimates from as many engineers,” an 1877 newspaper story stated. 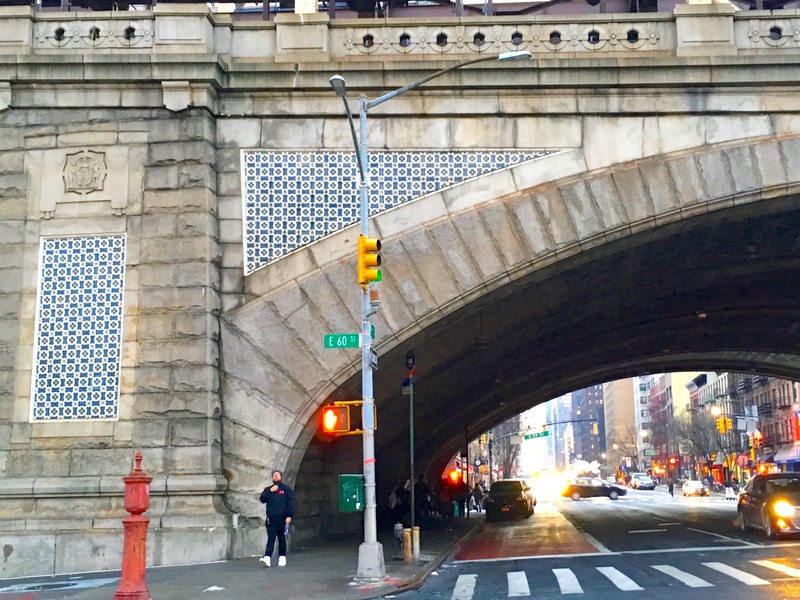 Of course, there is no East 77th Street bridge (and Queens is just across the East River, not Brooklyn). So why didn’t the project go forward? It started to, tentatively. 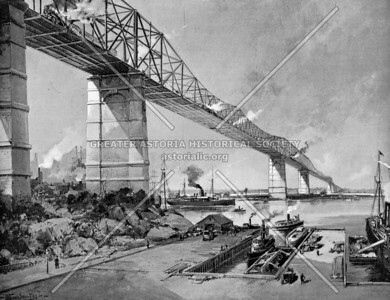 In 1881, a caisson was sunk into the river on the Queens side, off the outpost of Ravenswood, according to the Greater Astoria Historical Society’s The Queensboro Bridge. But it was the future Brooklyn Bridge that captured New York’s fancy. With less money and interest, the company chartered to build a bridge to Queens put a stop to construction. 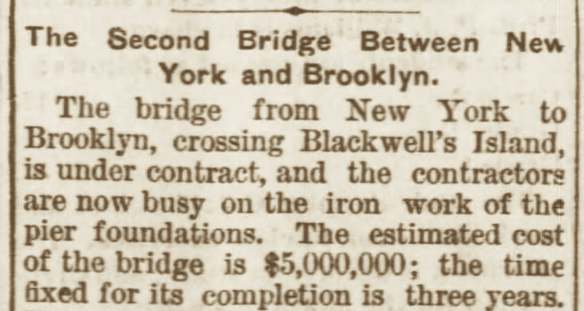 Almost two decades after the Brooklyn Bridge opened, and only a few years since Brooklyn and Queens became part of greater New York City, plans for a bridge were drawn up again . 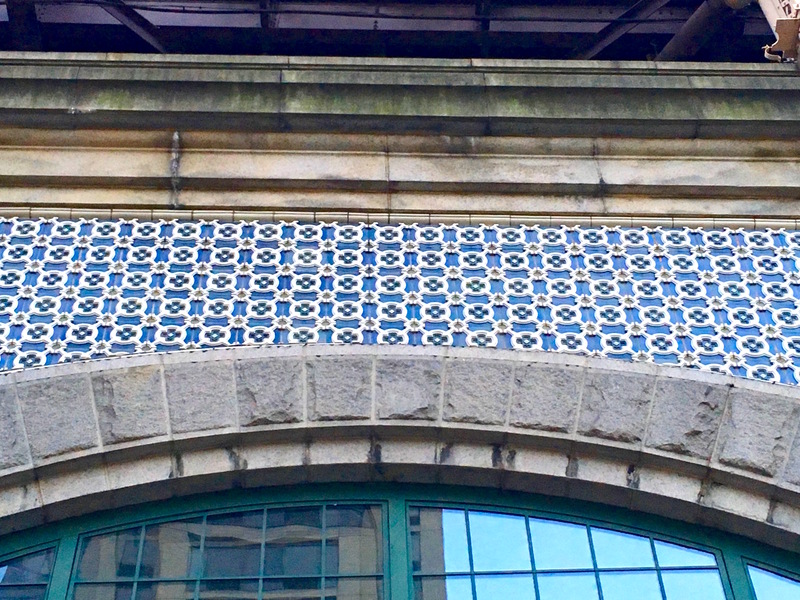 . . resulting in the graceful cantilever span known as the Queensboro Bridge in 1909. 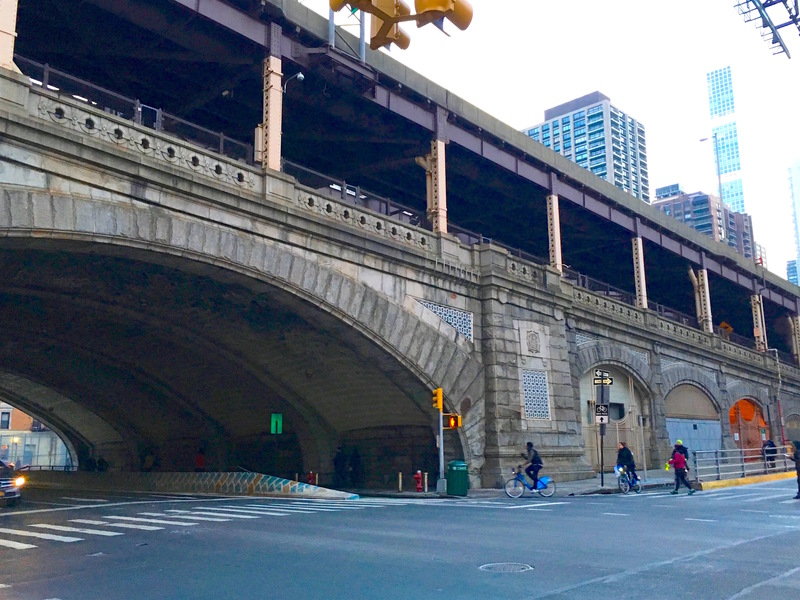 New York is a bridge proposal graveyard, as these images of other bridges never built attest. Soda sales are down—and so are the number of soft drink–branded signs fronting the diners and newsstands on New York’s streets. I don’t think anyone is officially keeping track of how many privilege signs—as these signs are technically called—disappear every year from the city’s dwindling number of independent diners, luncheonettes, and newsstands. Though their numbers weren’t great 10 years ago, more signs are biting the dust (like two out of the three photographed in this post from 2008). 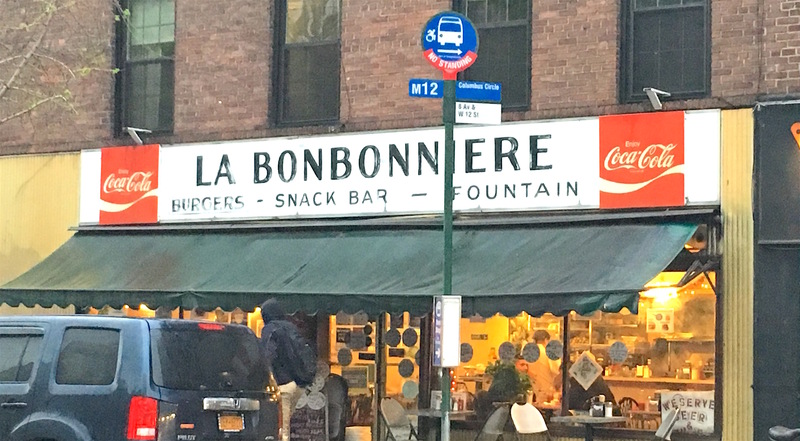 Luckily two stalwarts seem to be safe: the signs atop the West Village’s delightfully named greasy spoon diner La Bonbonniere and Eddie’s Sweet Shop, a 107-year-old ice cream parlor in Forest Hills. Let’s hope the rest of the remaining signs scattered around the five boroughs hang on. 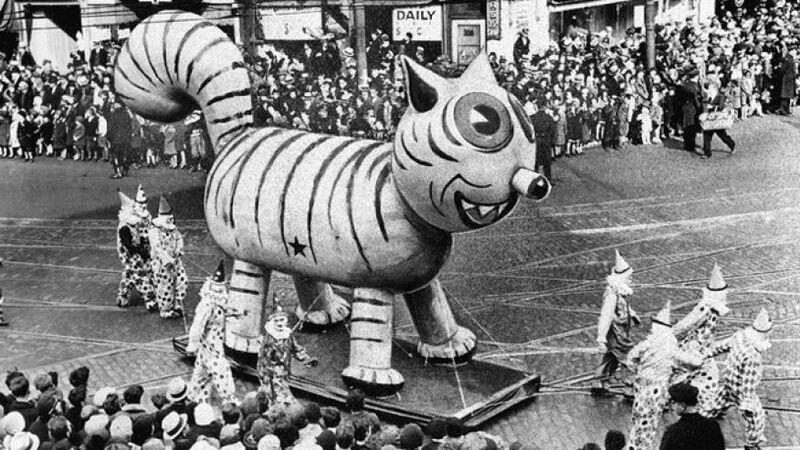 Ever since Macy’s added balloon floats to their iconic Thanksgiving Day parade in 1927, mishaps and fails have become regular occurrences. 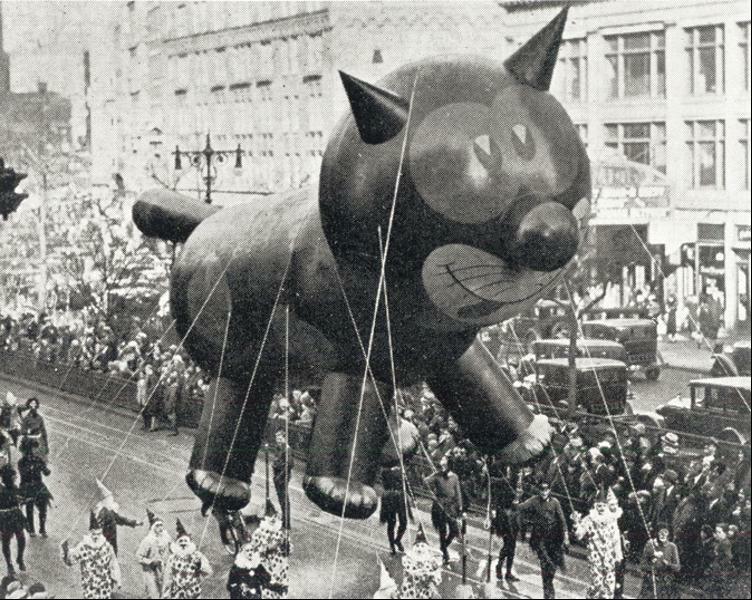 Felix the Cat (above) got tangled in telephone wires that year. Popeye dumped cold rainwater that had collected on his cap onto the crowd in 1957. And poor Kermit the Frog; his head sadly deflated in 1991. 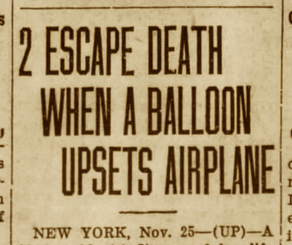 But at least it’s been 83 years since a float was hit by an airplane. 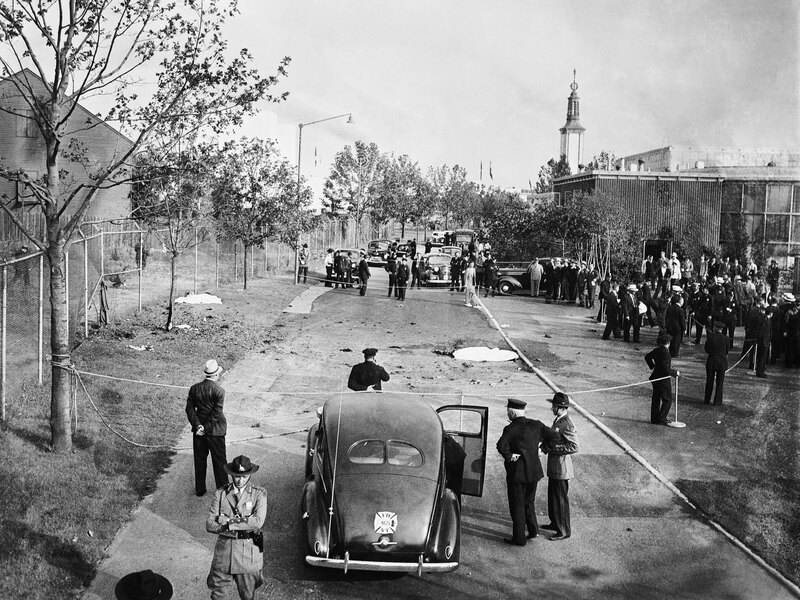 This midair collision happened in 1932 over a heavily populated area of Jamaica, Queens—long after the parade had ended and the helium-filled balloons were released into the sky (the custom in the early 1930s). Annette Gipson, 22, happened to be at the controls of a biplane with her instructor, flying at 5,000 feet. 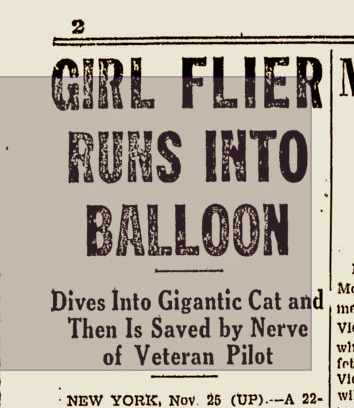 All of a sudden, the brazen “girl flyer,” as newspapers dubbed Gipson, noticed the 60-foot Tom-Cat balloon coming her way. “She shouted, ‘I think I’ll have a piece of the neck’ to [her instructor], as she took dead aim at the cat,” reports the book Macy’s Thanksgiving Day Parade. Before it did, her instructor managed to take over. As the craft came within 80 feet of rooftops, he got control and was able to land at Roosevelt Field, as planned. Considering that she almost crash-landed in the middle of Queens, Gipson was nonplussed. “It was a sensation that I never felt before—the whirling housetops, rushing up to meet me—and the thoughts of a whole lifetime flashed through my mind,” she told reporters who had rushed out to Roosevelt Field to speak to her after they’d been tipped off about her collision. 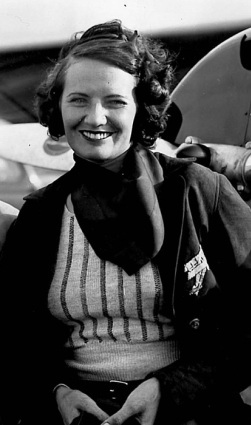 Gipson went on to become a prominent “aviatrix,” as the newspapers called her, touring the country and hosting headline-grabbing women-only air races at Floyd Bennett Field.